National S’more Day was last week but any day is a good day for a s’more! The girls are soaking up the last days of summer before going back to school and spending lot of time with friends having fun! Last week S had a friend over while A was at gymnastics camp. Her friend and her were having fun and came in and were ready for lunch. Going through what they wanted, what her friend would eat, and what we had in the house they knew they wanted smoothies or smoothie bowls. 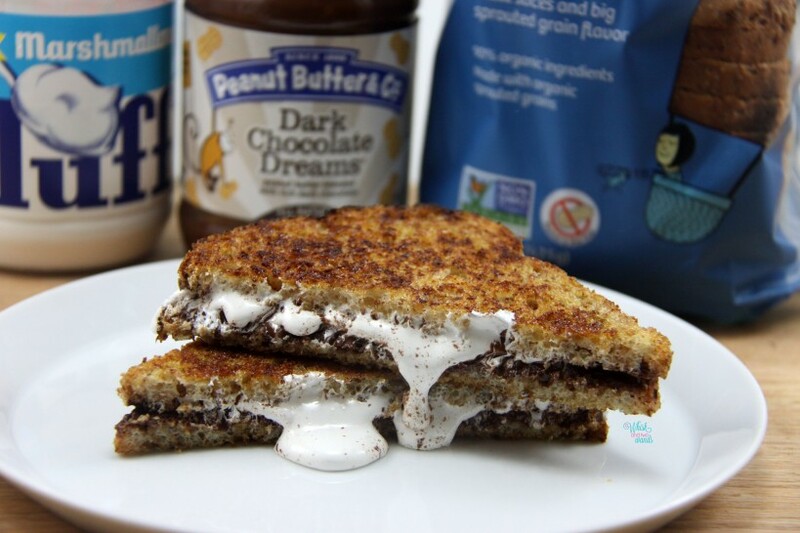 I let S whip up some smoothie and I decided to whip up something fun and different for them……Grilled S’more Sandwiches! A sandwich made with Peanut Butter & Co Dark Chocolate Dreams chocolate peanut butter and marshmallow fluff, similar to a Fluffernutter. A Fluffernutter sandwich made with peanut butter and marshmallow fluff usually served on white bread. I made them on sprouted Silverhills Little Big Bread and to get the graham cracker flavor I sprayed the bread with coconut oil, instead of using butter as you usually would for a grilled cheese, and sprinkled it with coconut palm sugar and cinnamon before grilling it. The girls loved it! While this isn’t a sandwich I would make my kids on a regular basis it is fun to make on occasion for a treat. Today was the perfect day to share this as we will actually be having lunch today at Peanut Butter & Co in NYC! I’m not sure who is more excited about it me or the girls but I can’t wait. Of course I will be posting pictures on Instagram so you will have to check out what we get when we are there (Miss_Whisk) on Instagram! So many choices I still don’t know what I will get when I go and I will probably be like a kid in a candy store wanting to try everything! Have you ever had a Fluffernutter sandwich? What is your favorite peanut butter sandwich combo? Pre heat your griddle or pan over medium-high heat while preparing your sandwich. Make the sandwich spreading peanut butter on one slice of bread and marshmallow fluff on the other slice of bread and placing them together. Spread the top side lightly with coconut oil, or spray with coconut oil, and sprinkle with coconut palm sugar and cinnamon. The amount will depend on the slice of bread and how much you want. I just take a big pinch and sprinkle it over the bread. Flip and repeat with the other side. Or place the prepared side down on the hot griddle and prepare the other side. This is what I do as I use coconut oil spray. Grill 1-2 minutes until outside is grilled, brown, and crispy. Flip and grill the other side. Enjoy! Oh my yum!! My son is drooling! 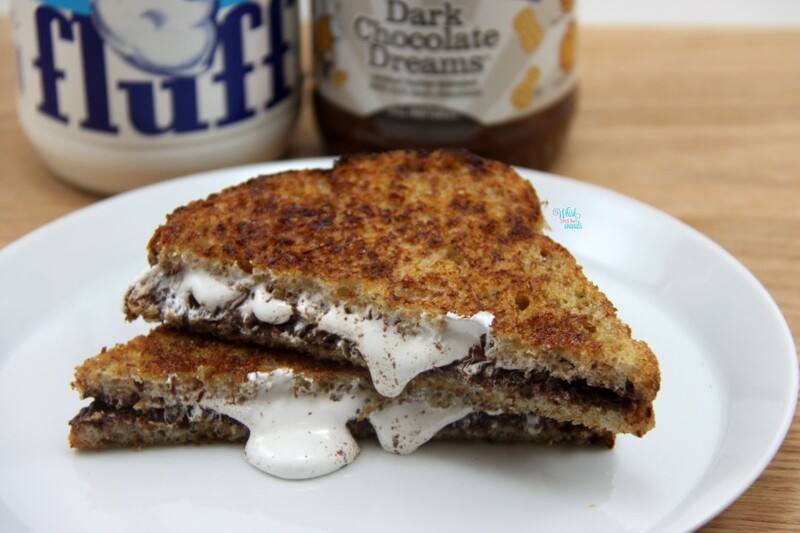 I so wish I like marshmallows….this looks amazing!